B&W image of Model 105. It is shown with covers off. 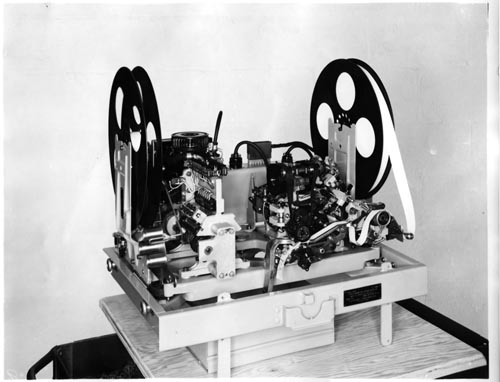 Visible are the two paper tape reels,motor, perforation mechanism. It is mounted on plyboard. . A black identification label is affixed to chassis "Signal Corps U.S.Army Automatic Numbering start of message Indicator & Monitor unit AN/GGC-2 ( ) Serial No. Order No. 26802-PH- 51 Klienschmidt Laboratories Deerfield Ilinois"
Verso: "KIienschmidt Laboratories Model 105 Automatic Numbering Start of Message Indicator & Moni tor Test Model"